I love visiting temples and shrines in Japan – not just the bigger or more famous ones that commonly top the visitor lists, but also the smaller ones that don’t attract much attention or are tucked away in rural pockets of the country. In part this is probably because I’ve always lived in rural Japan myself, so seeing secluded little temples and shrines dotted about the place is par for the course. Also though, I tend to love these kinds of places for their own sake – there’s just something about the quiet, mysterious, slightly unkempt feel that I like over many temples and shrines that are constantly bustling and meticulously kept, every tree branch and pebble in their place. Plenty of these spots, despite being near major roads or within close walking distance of train stations or bus stops, are all but bereft of visitors for the majority of the year. Even longtime locals might not know the names of these places or what god(s) are enshrined there. 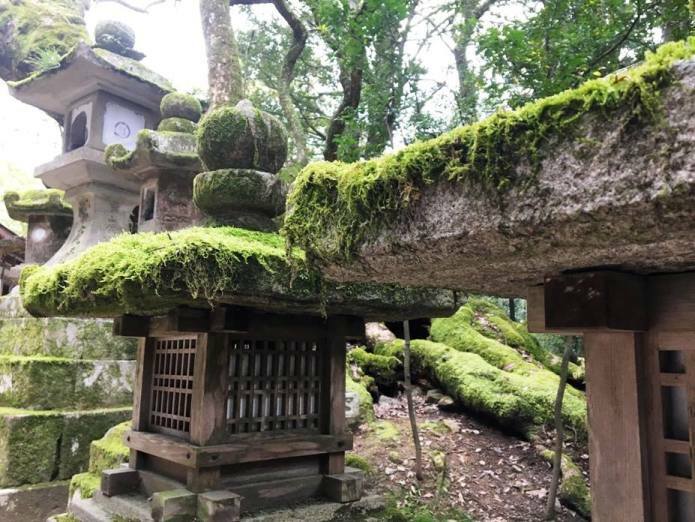 While activity might pick up during major festivals or on traditional holidays, such temples and shrines otherwise lie silent but for the birds (or sometimes monkeys, deer, or even odd wild boar), and the stone gates and lanterns are typically mottled and moss-covered. In a word, it’s atmospheric – and without any other people around to be conscious of or worry about inconveniencing, it can make for some wonderful photography opportunities. That being said, nobody should have cause to feel as though they’re sneaking around or doing something wrong when they’re alone and taking photos of temples or shrines in Japan. Photography of the buildings, decorations, and the grounds in general is for the most part perfectly acceptable, for tourists and residents alike. The only hard and fast rule for the vast majority of these places is to refrain from taking photos of the inside of the buildings, where the altar and associated religious memorabilia reside. Incidentally, there’s also nothing wrong at all with using temples or shrines as places to just chill for a bit, which is often much easier to do when there’s a lack of noise and bustle. Obviously people shouldn’t sit on anything that clearly isn’t intended as a seat, or do anything that would be considered overly loud or disruptive even if there were other people around to be considerate of. However, there’s nothing disrespectful about taking advantage of the stillness to read, write, sketch, or simply daydream a while. I certainly have on multiple occasions, and I’d definitely encourage others to do the same! It can be quite the experience. Question of the post: Do you have a favourite temple or shrine in Japan you’ve visited, or even just seen photos of that you’d like to visit? Is it a really big/famous one, or more off the beaten tourist path? This entry was posted in japan, photography and tagged shrine, temple. Bookmark the permalink. Meiji Shrine is quite nice, albeit not one of my favourites. Whenever I go to that area, I always find myself spending way more time around the shopping area than I do the shrine, haha. I’m just curious about it since I see it often on series I watch. Now I’m curious about the shopping area around it, too. Hahaha! I’d love to visit the Nanzo-In Shrine in Fukuoka area. The giant Buddha they have there is something that I would adore to experience in real life. Ah, that one’s actually a temple – and a pretty cool one too! I definitely recommend you see it if you ever have the chance. Japan has a few very impressively-sized Buddha statues, but that one takes the cake. Oooh okay!! Got it. And yeah, they have so many extraordinary Buddha statues. I’m a practising Buddhist so it woes me so much and makes me feel so spiritually… relaxed? Positive? Something like that when I see those statues. I fee like they were made with a lot of respect. I was amazed at how many shrines/temples (some quite small) there were tucked into neighborhoods. Found one in the middle of a block, surrounded by parking, which was in turn surrounded by apartment buildings. The shrine property itself was maybe 1-2,000 sq feet at best – and looking at it in street view it was very nicely kept up. Though it looked like there was public access I found myself wondering if the residents of the surrounding apartments thought of it as their own private place. Oh yes, even in major cities, there are shrines and temples absolutely everywhere – some small, some big, many squeezed between large buildings and general urban sprawl. Generally speaking, shrines are open to anyone and everyone, and don’t have a closing time. Temples are sometimes privately owned but usually also open to visitors. They do tend to close around 5pm though, as unlike shrines, they mostly have large gates that are barred at night. Ooh, I love those pictures. They look so inviting. 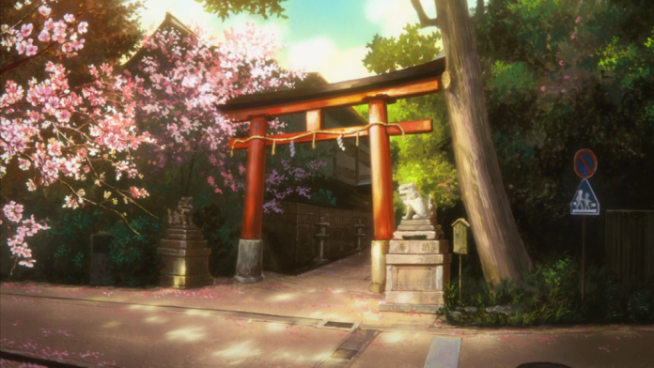 I haven’t done any research, and how I think about shrines is mostly influenced by anime (The Eccentric Family, Kyousougiga, Kamichu, and Gingitsune come to mind almost immediately), and I’d rather not let that shape my perception any more than I have to. But taking a break and reading a book or a magaizine at one sounds a great way to spend time. As an atheist, I wonder what the best option would be to show my appreciation? Buy a fortune/charm? Are donations without a particular wish or trinket attached a thing? I’m curious about this. Actually, that very top picture is an anime screenshot, lol. Looks pretty realistic though! I’m also an atheist, and at heart, I think a great many Japanese people are. They still regularly visit shrines and temples not out of religious duty, but more a social and habitual one – tradition rules here. Even so, there are plenty of things people often do to show their appreciation of the beauty, culture, etc. They make small donations into the coin box that’s at every public shrine and temple, buy protective charms (omamori), buy fortunes, and in some cases celebrate festivals or pay their respects by paying priests to carry out services like site consecration, attend town functions, and perform various other personal or public ceremonies. Ooh, I didn’t notice that was an anime picture, but once I know it I can’t see it in any other way. Minds are tricky things (well, mine anyway). Coinbox most likely for me then. Or maybe a fortune. I live in Hosoe, a small village in Hamamatsu. The local shrine here is dedicated to earthquake protection and is rare among shrine practitioners. It’s quite worn and weather beaten, but if you’re ever up this way, its shinboku are impressive for the area. That sounds lovely! I’ve been to Shizuoka, but never made it to Hamamatsu despite a good friend of mine having lived there for several years (he’s moved away now though). If I ever do make it to that area, I’ll be sure to check it out!